The Hub was proud to host the 3rd Symposium at Deakin on the 18/19th February. This year featured four fantastic international guest speakers – Prof Greg Rutledge from MIT spoke on process-structure-property relationships in electrospinning, Prof David Kaplan from Tufts University shared many fascinating research projects his group is undertaking on silk materials. Prof Jeff Wiggins from the University of Southern Mississippi spoke on the latest developments in optimising carbon fibre performance, particularly for aerospace applications and Dr Rudolf Hufenus from EMPA Swiss Materials Science and Technology spoke about several examples of bicomponent fibres including as artificial turf for soccer pitches. 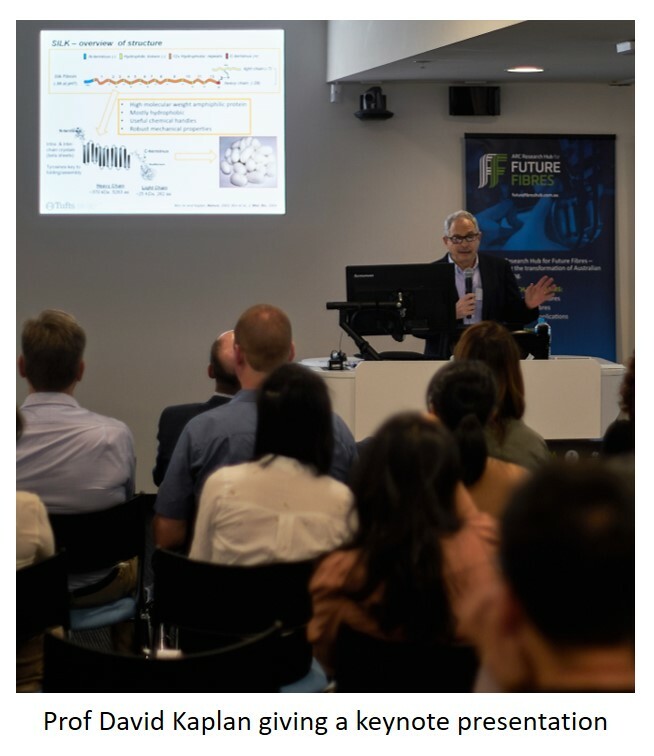 Local speakers included Dr Jelena Rnjak-Kovacina (UNSW) discussing silk biomaterials for cardiovascular applications and Dr Linda Hillbrick providing an update on wet spinning research at CSIRO. The final session saw our seven Hub-funded PhD students present updates of their projects, on topics ranging from utilizing cotton textile waste to understanding residual stress in carbon fibre composites and multi-functional MXene-based materials. Hub members and associate members ended the day with networking over drinks and dinner at Waurn Ponds Estate before reconvening on Tuesday for the closed day of the Symposium. Updates from the Hub’s industry-focused research program were shared before the attendees broke into groups for more detailed discussions with the visiting international guests. These discussions were very fruitful and will likely lead to several collaborative research projects and some international researcher exchanges.